Often it seems we live in a virtual world, where everything is just a mouse click or an app away. Still, sometimes you need to get analog self from one place to another, like school, work, the café or a friend’s house. And that’s where the Honda Metropolitan comes in. In a point-and-click world, you just point it where you want to go, click on your helmet, and before you know it you’re there—with no worries about traffic congestion, parking hassles, and high fuel prices. Plus, you’ll have a blast just getting around. In fact, the worse traffic gets, the more the Metropolitan makes sense. Sure, it looks cute, but underneath that curvy bodywork, it’s pure Honda. 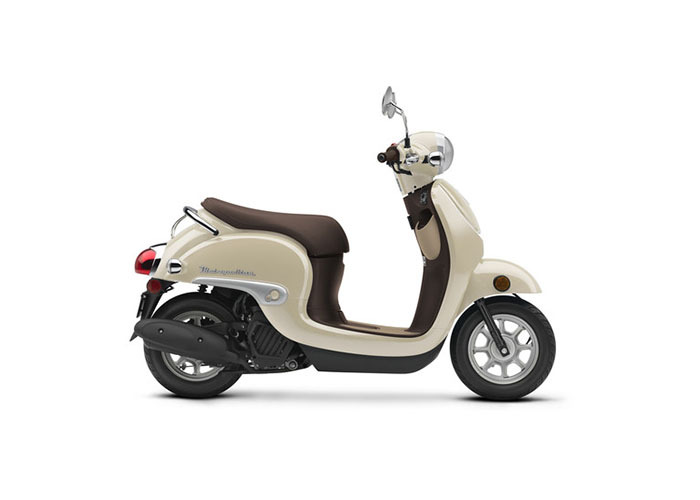 With a liquid-cooled four-stroke engine, it offers the kind of reliability no other scooter in the class can touch. Ease of use? You get a no-shift automatic transmission—just turn the key. Press a button for the electric starter, and you’re on your way. Practical? Check out the lockable underseat storage space, perfect for grocery runs. But the real genius behind a Metropolitan isn’t the way it solves so many of your transportation problems. It’s how much you’re just going to love riding it. PROGRAMMED FUEL INJECTION (PGM-FI): The Metropolitan features a liquid-cooled 49 cc four-stroke engine with fuel injection. It’s quiet, economical, and super reliable—everything you’d expect from a Honda.